Daniela is one of the most sought-after and respected belly dancers in the NY metro area. By drawing not only on her extensive Middle Eastern dance training, but also on her broad dance background, she has been captivating audiences since 2002. Daniela's formal training began with her first dance class at the age of 2. Her strong dance foundation came from her studies of tap, jazz and ballet at Strut Your Stuff Studio of Performing Arts, in College Point, NY, under the direction of Julie Smith-Corbett. In college, Daniela found an interest in hip-hop, and she was the captain of the Dance Team at Adelphi University. It wasn't until after college that Daniela discovered the art of Middle Eastern Dance. Daniela began her studies of Middle Eastern dance with the internationally acclaimed Amira Mor. While performing as a soloist with the Amira Mor International Entertainment Company, she danced at prestigious events and venues throughout New York and New Jersey. She was also a featured dancer in two of Amira's instructional videos - Bellydance Your Way to Cardio, and Bellydance Your Way to Ecstasy. While living in California for several months, Daniela was fortunate to be able to continue her studies with the award-winning bellydancer Alyne, from San Jose, CA. Over the years, Daniela has taken every opportunity to expand her knowledge and skill, attending workshops and classes with amazing instructors such as Aradia of Las Vegas, Adriana Lira of Brazil, Fahtiem, Suhaila, Jillina and Nourhan Sharif. Daniela is not only a talented performer, and a caring and patient instructor, but she is also a successful event producer. She directs and produces several events each year, ranging from small restaurant engagements to large stage shows. 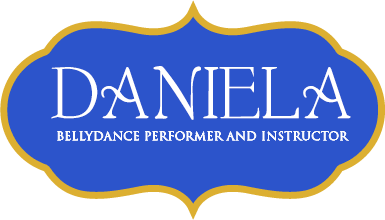 Daniela is also the founder and director of the Daniela Dance Company, a professional belly dance performance ensemble.